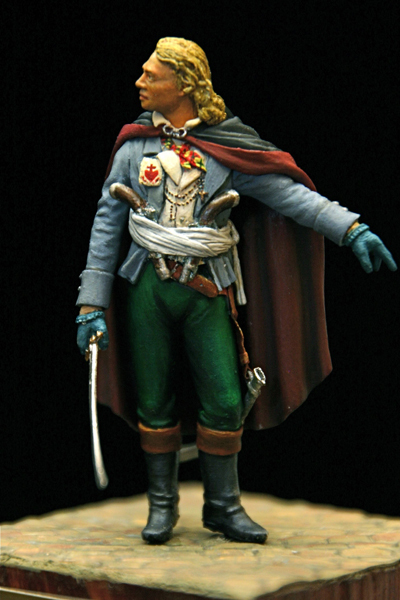 One of my favorite figures is the 54mm sculpture of Jacques Cathelineau produced by miniature company Nemrod. I entered him in the SCAHMS show a few years back and what follows in the text I used to accompany the entry to give some background. I can’t recall exactly where I found the text – I probably edited it together from Michael Davies book and other internet sources. 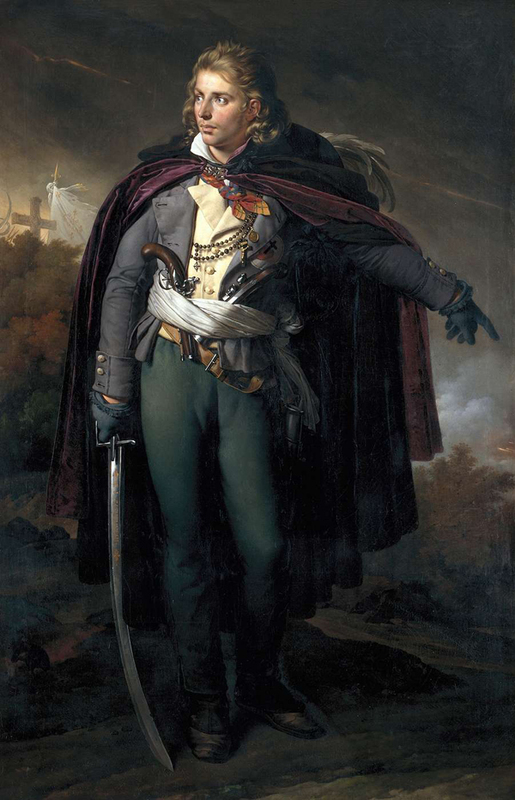 The figure is based on a famous painting of Cathelineau by Anne Louis Girodet de Roucy Trison. Perhaps the most famous common man to fight against the infamous French Revolution was the heroic Jacques Cathe­lineau. He was a brilliant strategist and a natural leader. Born in Pin-en-Mauges on January 5, 1757, there was nothing in his background to suggest that he would become such a legendary military leader. Before the revolution he was a traveling salesman, living a peaceful life with his wife and five children. The Vendean rising occurred when France’s revolutionary government began to restrict Catholic worship. On 24 August 1790 the decisive blow came with the unfortunate King Louis XVI forced to give royal assent to the civil constitution of the clergy, by which the Church of France was turned from being Catholic into a mere national establishment, defying the author­ity of the Pope. The regime also brought in what are now familiar revolution­ary policies: a stream of arbitrary laws on nationalization, wage and price-fixing, arbitrary powers to municipal councils, taxes, levies and ultimately requisition and expropriation. The Catholic clergy remained as a force to challenge these injustices. The re­gime therefore enforced their replacement by schismatic clergy who had taken the civil oath. All this was massively rejected by the Vendee and elsewhere. Churches served by the “intruder-priests” – were deserted. The people went to hear Mass in the woods with their old pastors who had refused the oath and gone into hiding to avoid arrest. The first insurrection arose in Brittany in February 1791 and then spread to the Vendee. It was greeted with brutal savagery. In September 1792 the Republic was proclaimed and on January 21, 1793, the King and Queen were guillotined. The news was greeted with profound shock. The Republic thought it had silenced the peasants, but in fact they were preparing for all-out-war. Early, in March 1793 the whole West rose, the peasants leading. Cathelineau armed himself with his rosary, a pistol, and a saber, pinned a badge of the Sacred Heart upon his tunic, and went out into the public square. 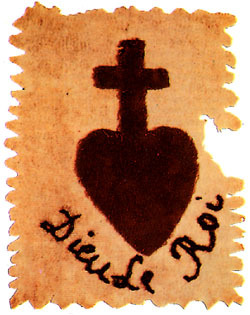 During the seventeenth century, the whole of western France had been stirred by the missions of St. Louis-Marie Grigon de Monfort, and the red badge of the Sacred Heart, popularized by the saint, was to be come the principal emblem of the Vendean solders, together with the White Cockade, symbol of legitimate Christian monarchy. In quick order he organized the local forces and then went from town to town, enlarging his army through his appeals for loyalty to the Church and the Kingdom of France. When Cathelineau engaged the republican forces sent in to suppress the Vendee uprising, he was the ideal warrior. His tactical skill was well known, as was his desire to be among his troops at all times, fighting alongside them. This deeply endeared him to his soldiers who soon gave him the name, “The Saint of Anjou” for his brilliance, courage and piety. After the victorious battles of Fontenay and Chemille in April and May 1793, the Vendeans were organized into a united force: the Grand Catholic and Royal Army. The post of Commander in-Chief fell upon Cathelineau. It was an inspired choice. The Vendeans secured an extraordinary number of astonish­ing victories against impossible odds. Cathelineau believed in the principles that would later be known as ‘shock troop tactics’ , charging quickly into the enemy ranks and fighting them hand-to-hand, causing panic and confusion. However, his bravery would ultimately be his undoing. After taking the city of Angers, the Grand Army council decided to attack Nantes. The city was well defended, and while storming the city a shoemak­er shot him from a window in the center of town. Doctors were unable to remove the bullet in his chest and the wound became infected. On July 14, 1793, Cathelineau died at Saint-Florent-le­ Vieil. His death was mourned as one from which the counter­-revolution would never be able to recover. The tide had turned against the Vendeans, although each time the republican Convention declared that the Vendee was finally silenced, the Grand Army would win another victory against terrible odds. Then a new republican general arrived in the West, Louis-Ma­rie Turreau, infamous for commanding the “infernal columns” which marched through the Vendee burning, pillaging, rap­ing, bayoneting and attempting to kill every living thing. This genocidal policy was undertaken by order of the Committee of Public Safety in Paris: “Exterminate every brigand to the last – that is your duty.” The columns marched all over the Vendee for seven months from January until July I 794.Turreau proudly reported that no prisoners were taken. The Vendean badge of the Sacred Heart "God and the King"
But even all this did not cow the Vendeans who rallied to their remaining chiefs. On 15 October 1795, they awaited the arrival of the Count d’ Artois, the King’s brother. He never arrived. “Monsignor, you have brought me my death warrant! Today 1 have 15,000 men; tomorrow I shall have barely 1,500!” cried Charette to the King’s messenger. Hope faded and parishes began to lay down their arms. Yet, still the war was not over. Both Chouans and Vendeans, despite the desperate state of the countryside, continued the battle so long as full freedom was denied to the Church. By 1796, however, the Directory had fallen and a new leader appeared: Napoleon Bonaparte. He immediately began to treat with the Vendean religious leader, Abbe Bernier. By December full liberty was restored to the Church. However, the Vendee was only calmed after 15 July 1801, with the signing of the Concordat between the Pope and Bonaparte. But the cost in hu­man life and suffering had been incalculable. In this great epic of heroism, endurance and sacrifice it has been said that the Vendean struggle was a costly failure. It was certainly costly; but not a failure. The peasants fought to restore the King, the Catholic religion, and to avoid service in the revolutionary militia. In the last two they were successful and visibly so. True, they did not immediately restore the King, but the monarchy returned in due course.